The conference is now history. Read the report by Andrey Vozyanov. 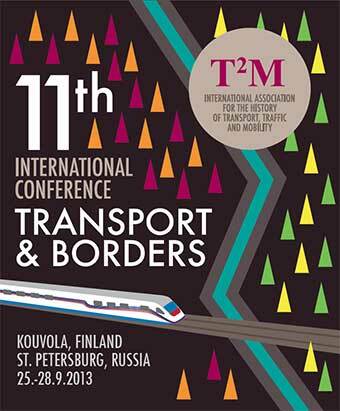 The International Association for the History of Transport, Traffic and Mobility (T²M) calls for papers to be presented at its 11th annual conference, which will take place in Kouvola, Finland and in St. Petersburg, Russia on September 25th -28th 2013. The Local Organising Committee of The International Association for the History of Transport, Traffic and Mobility (T²M), (The Centre for Railway Culture REILIA of the University of Helsinki and The Petersburg State Transport University) invite all academic researchers and practitioners working on history, sociology and politics of transport, traffic and mobility, border studies and transportation technology to participate in the Conference, a scientific meeting dedicated to the study of transport and borders in all parts of the world. The Conference will take place in Kouvola, Finland and St. Petersburg, Russia, on September 25th-28th, 2013. These cities provide an ideal setting for discussing the role of borders in transport, travel and mobility research. The conference will include an opportunity to visit two countries; in and outside of the European Union. The conference will start in Kouvola on September 25th. On September 27th the conference will move by train from Kouvola to St. Petersburg to embark on the second part of the conference. The T²M Annual Conference is open to papers and sessions on any field or topic of historical and social science mobility studies. 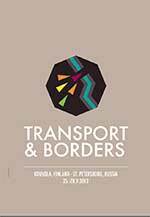 However, we especially invite the submission of single papers or full sessions (three papers) on any topic related to “transport and borders”. Besides physical and national-state borders, many other kinds of borders impede and shape mobility: cultural borders, which can divide cities and regions, mental borders, which limit individual space of manoeuvre and technical borders. This Cross-border Conference therefore invites scholars to examine past and current reconfigurations of borders and mobility from the perspective of one or multiple disciplines. Papers could, for example, examine borders as zones of contact and interaction, as zones consisting of both the flows of people and goods across as well as those flows blocked by the borders between states. Views from the borders will give us fresh insights into the relationship between transport and society, centre and periphery, security and insecurity; museums and universities, politics and identity and researchers and enthusiasts. The 20th Century has encountered the parallel rapid development of transport technologies and mobility devices and the closing of borders, the erection of iron curtains, the isolation of whole continents against migration and escape. In these ways borders have become more perceptible and sensible. Social science mobility scholars have emphasized the individual and collective horizon of possibilities in order to understand and explain the cultural boundaries of physical travel and mobility. Passing borders and customs has often been experienced, witnessed and described as a partly risky step of transcending boundaries. The Conference will discuss these individual and collective appreciation of borders and boundaries and its impact on and interaction with travel and mobility. Transport infrastructure have for long times been established and maintained mainly by governmental institutions and corporations. Border regions and borders are regions of thining out transport infrastructures and schedules. Georg Simmer has used the term of deserted border regions (Grenzwüste) to describe the border as cordon sanitaire. The conference will discuss the development, function and the end of borderlands as marginal regions and fringe. In order to advance collaboration between universities and policy makers, both academic researchers and practitioners working on transport and border issues are most welcome to attend. It is a T²M tradition that paper and session proposals are not limited to the general topic. We ask for paper and session proposals for all themes in the field of transport, traffic and mobility. By this, the annual conference will give, in a broad way, an up-to-date overview on the field of historical transport and mobility studies. The Conference language is English. No interpretation into Russian or other languages is provided. The final deadline for proposals is April 15th, 2013. The proposal must include a short abstract, the title of the presentation, the name of the presenter(s), CV, e-mail address of the author(s), contact number and information on audiovisual needs. Papers must be sent to: submissions@t2m.org. Once the proposal has been accepted, we shall notify participants before May 15th 2013. The deadline for the full paper (6-8 pages) is August 15th 2013 for we shall distribute all papers beforehand in an online version. Individual presentations at the Conference are therefore to be limited to a fifteen-minute summary to allow for debate and discussion within the session. Submission of a fully completed poster form is mandatory for all speakers, for T2M wants to invest more energy into communication. Deadline of final posters is: August 15th 2013 to submissions@t2m.org. The poster format should be a pdf. It will be published in A2; therefore remember: pictures in fine resolution and letters of appropriate size. Posters will be judged. The best posters will receive a prize. The participants may need to obtain a visa either to Finland or Russia or both. The Organisers of T²M are prepared to assist delegates with obtaining a visa by sending official invitation letters upon request. This letter however does not involve any commitments by the Conference Organisers to cover fees, accommodation, travel expenses or other costs connected with participation in the Conference. To obtain an invitation to T2M, delegates must first complete the registration form and settle all conference and related fees. Delegates are encouraged to make their invitation requests at their earliest convenience. Please note that delegates are responsible for their own travel arrangements, including determining the visa requirements for travel to Finland and Russia for the Conference. If you are considering participating in any post-conference tours, please see about making the necessary visa arrangements (e.g. multiple entry visa to Finland, if required if you want to return back to Finland after the conference days in Russia) prior to your departure for the Conference. The T²M Organisers will not be held responsible for a visa not granted. Failure to obtain a visa will not be accepted as grounds for refund of any fees or any other costs paid to the Conference. Finland is a member of European Union and a part of the Schengen area. Attendees from some countries will be required to obtain a visa to enter Finland. More information on visa requirements in the Schengen area and travel documents accepted by Finland (by country) can be found on the website of the Ministry for Foreign Affairs of Finland. People from most countries must apply for a Russian visa. Visas cannot be obtained at the border. The visa process in different in each country and can require a long time. Please, check the Russian visa regulations in your own country in the Russian embassy or at a travel agent.